Fire! Is this the new norm? 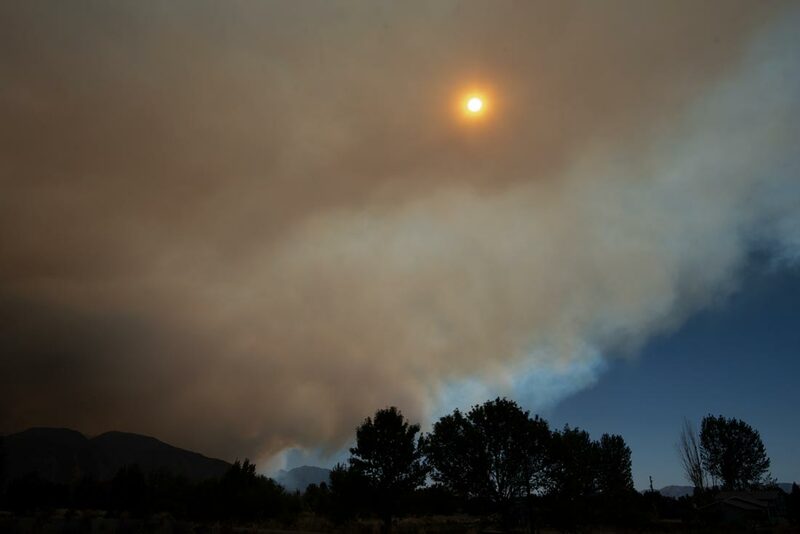 Above, two fires - the Pole Creek Fire and the Bald Mountain Fire - burn above Salem, Utah, prompting the evacuation of 6,000 residents of several communities. The Summer of Smoke started with a broad blanket of smoke drifting into Utah and Idaho from large California wildfires, prompting air quality alerts along the Wasatch Front. The skies had barely cleared when both Utah and Idaho had their own local fires. 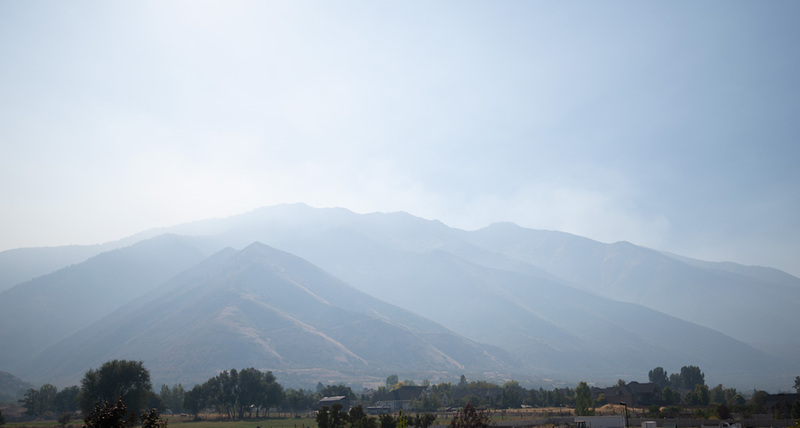 Within 11 miles of our house in Mapleton, Utah, the Coal Hollow fire spewed forth billows of smoke that obscured our normally blue skies. 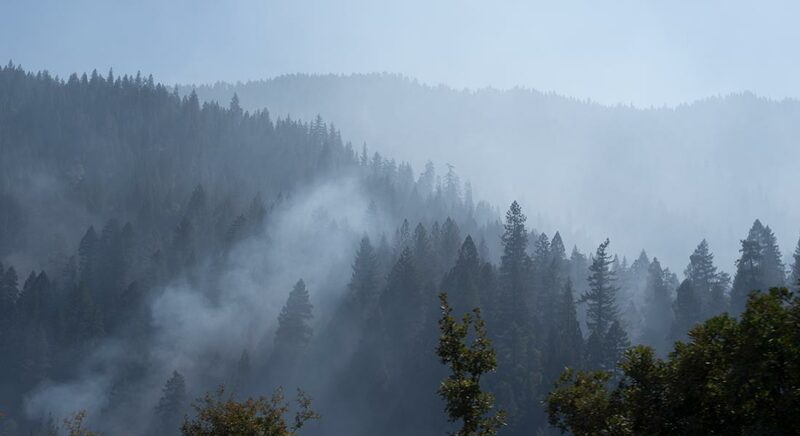 In its wake came two other large wildfires – the Pole Creek Fire and the Bald Mountain fires which joined up to burn more than 113,000 acres and are still burning within five miles of our home as I write this. 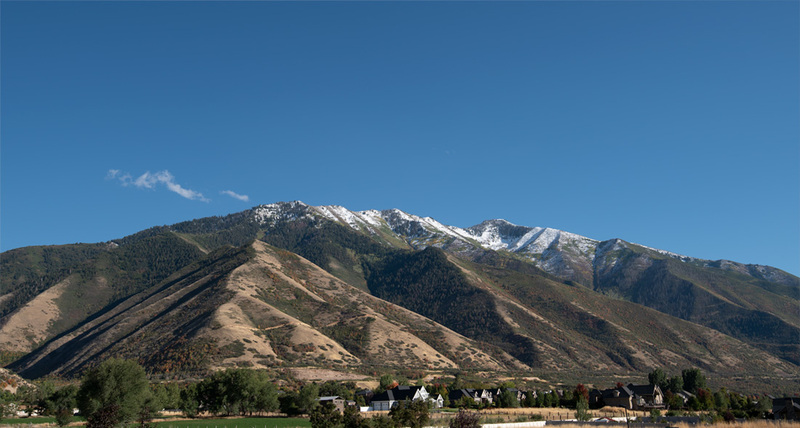 Move the slider below to see the difference between the usual air quality in Mapleton, Utah, and the way it look last week because of smoke from nearby wildfires. Smoke from the Pole Creek fire billowing above our home. A brief trip to visit relatives in northern California and then to Portland, Oregon, last week was little respite. Fire has been on everyone’s mind in the West during this year of near-record high temperatures and little rainfall. 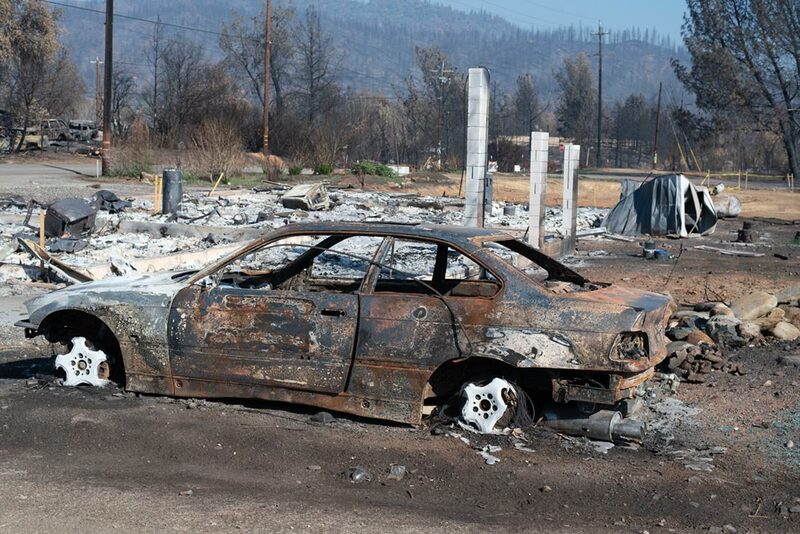 We drove through apocalyptic burned-out neighborhoods in Keswick, Utah, near Redding, where cleanup crews with bulldozers are scooping up and hauling away in a steady stream of dump trucks the charred remains of homes following the devastating Carr fire. A burned neiighborhood in Keswick, California. Smoke from the Delta fire north of Shasta Lake, California, lay like a thick mist along I-5, permeating our car, hair and clothing as we passed by. The Delta fire, which briefly closed I-5. We asked ourselves repeatedly, is this the new norm? Here are answers to some of the questions we've had about wild fires. Fire occurs when oxygen, heat and fuel come together in the right mixture. An ignition source has to come into contact with combustible vegetation that has an adequate supply of oxygen. If the moisture content of plants is high, the fire won’t burn well. High temperatures are required to heat and dry the plants to the point where they will burn. Dense forests, which provide more shade, have lower temperatures and therefore burn less. Less dense materials like grasses and leaves are more vulnerable to fire because they contain less water than branches and trunks. During droughts and heat waves such as this year's, plants dry out and are more flammable. The three main natural causes of fires are dry, hot climate conditions, lightning and volcanos. To this can be added a variety of human activity – sparks from a car, a bulldozer hitting an electric line, a careless dropping of a match or cigarette, abandoning of a campfire, hot bullet fragments, an originally controlled burn to clear land that flared out of control, and arson. Wild fires sweeping through vegetation are as old as plants, so old that they are believed to have had an evolutionary effect on the development of flora and fauna. Because of its dry climate, carbon-containing vegetation, the oxygen in its atmosphere, lightning and volcanos, the Earth’s cover has always been flammable. Fires aren’t all bad. They create habitat conditions for greater species diversity and many plants depend on fire’s effects to grow and reproduce. Fire helps return plant nutrients back to the soil and the heat of fire is needed to germinate some types of seeds. All wildfires are not created equally. Those that burn mostly subterranean roots and other buried material smolder slowly, such as peat fires. Fires that crawl along the ground are fueled by low vegetation such as piles of leaves, grass and low shrubs. They burn at a lower temperature and usually a slow rate, although the wind can increase their speed. Ladder fires burn small trees, downed logs and vines between low vegetation and tree canopies, The invasive plant kudzu can contribute to ladder fires. Crown fires burn tall trees, vines, and mosses at the canopy level. During the daytime, wood burns five times faster than at night because temperatures are higher, humidity is lower and wind speeds are greater. The sun warms the ground during the day, creating air currents that travel uphill. At night, cool temperatures causes air currents to travel down hill. Fires follow these currents. Wildfires can move as fast as almost seven miles per hour in forests and 14 miles per hour in grass. They can move forward beyond their own front on the sides to flank an area and can jump as wind carries embers and other burning materials over roads, rivers and other barriers. This can cause spot fires as far away as 12 miles from a fire front. Large wildfires can create updrafts that draw in cooler air from surrounding areas, creating fire whirls with the force of tornadoes that move at speeds of more than 50 miles per hour. Wildfires can generate so much thermal heat that they rapidly expand boulders and cause them to break. 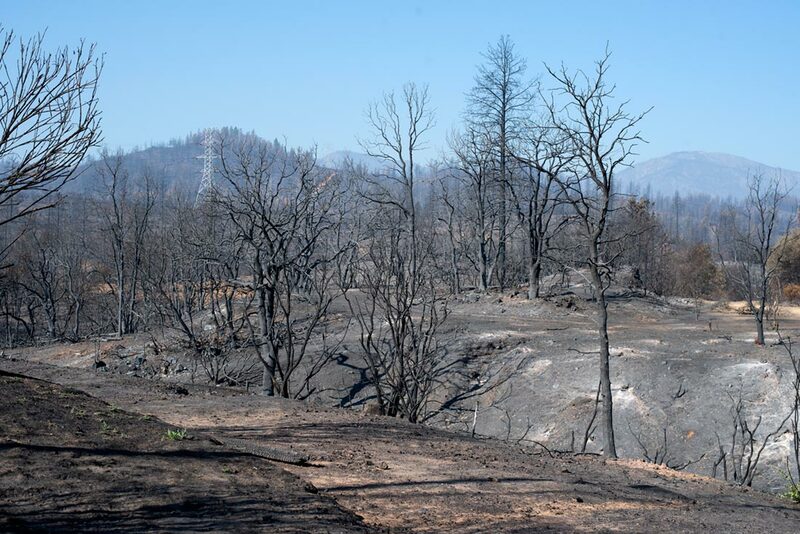 Fast-moving fire roared through this area in Keswick, California, stripping it of small dry vegetation and leaving only blackened trees behind. Prevention and early, effective fire detection and response are the main keys to limiting damage from fires. Preventive strategies are building structures with fire-resistant materials in fire-prone areas and creating a clear space around them that can provide a protective barrier against fire. Fire lookouts in towers and public hotlines are the most effective way to fight fire – there’s no substitute for an alert human observer. About 98 percent of fires in the United States are detected early and extinguished before they become large. It is the other 2 percent that cause major damage. Once a fire is out of control, it is difficult to suppress without a favorable change in the weather. Wild fires are controlled in a variety of ways. One is controlled burning, when a fire is allowed to burn within a certain parameter to burn out materials that could contribute to an out-of-control fire. Fire management crews even sometimes start smaller fires to control the growth of combustible plant life, because controlled burning ironically is the most effective treatment to reduce the speed by which a fire spreads, its intensity, the length of flames and the heat. Once a fire gets out of control, fire suppression is expensive and dangerous. Wildfires burn an average of 7 million acres in the United States annually and the U.S. Forest Service and Department of Interior spend an average of $2 billion-$4 billion a year suppressing them. Large fires are fought both from the air and on the ground. Working in teams, firefighters on the ground build firebreaks around fires to keep them from spreading, stripping land of possible fuel for that could feed a fire. Meanwhile, paratroopers jump out of planes to get to small blazes in remote areas and suppress them before they spread. While these teams are fighting a fire on the ground, air tankers drop thousands of gallons of water and retardant onto fires. Helicopters carry buckets holding hundreds of gallons of water and drop it onto fires as well as transporting firefighters into and out of fire areas. Large out-of-control fires can be deadly – a wildfire’s front can change direction quickly and jump fire breaks. Smoke inhalation can disorient firefighters in a fire’s vicinity so that they become surrounded by it. Fire fighters face life-threatening conditions – heat stroke, dehydration, fatigue, smoke, dust, burns, cuts from tools and equipment, snake bites, slips and falls, falling trees, vehicle accidents in hazardous terrain, poison ivy and oak, and electrocution from power lines of lightning. The work is strenuous and heart attacks are a significant risk. Smoke and dust from fires contain toxic gases including carbon monoxide, sulfur dioxide and formaldehyde. Fire retardants dropped on fires are aqueous solutions of ammonium phosphates and ammonium sulfates, as well as thickening agents – basically the same agents as fertilizers. They can affect water quality in an area. As a result, aerial applications of fire retardants must be 300 feet from waterways to protect runoff. 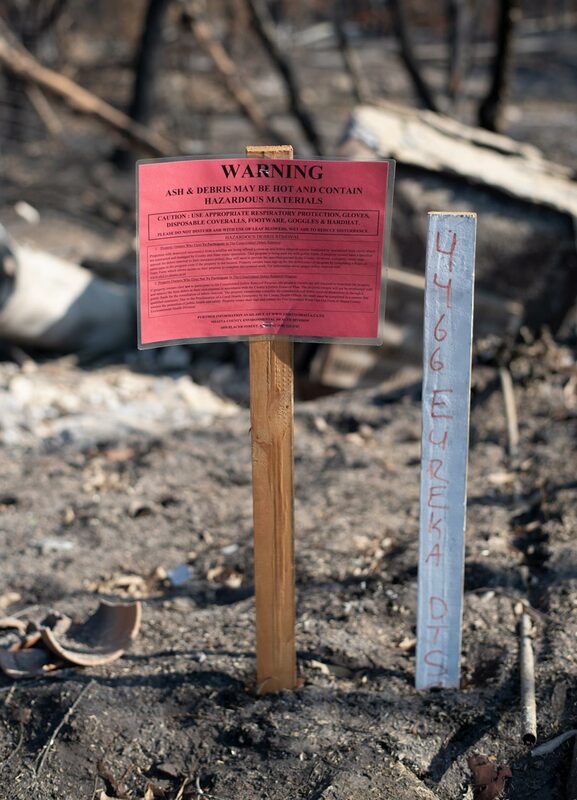 After fire retardant is applied to an area, the U.S. Forest Service assesses its impact. What is the trend and why? Can we expect more problems with fire in the future? Yes, the data indicates we can. In the Western United States, the length and the severity of the wildfire season has been increasing for decades, partly because of earlier snowmelt and climate warming. Warming temperatures have increased the intensity and frequency of droughts in many places, creating the conditions for more intense, widespread and frequent wildfires. The U.S. National Interagency Fire Center maintains a database of fires. The center has data from throughout the 20th century, but says that the data before 1960 is unrelaible because reporting before then wasn't standardized and some fires were counted two or three times. In addition, the method for estimating burned out areas wasn't standardized until the 1980s. However, using data from 1960 to the present, it is clear that climate change in the western United States has created conditions for larger, more destructive fires. Fires within the past two years are the largest on record in California, and 14 of the 20 largest wildfires on record in that state occurred within the past 15 years. The data shows a clear relationship between warmer temperatures and fire frequency and size over the past 15 years, which include ten years that are among the warmest years on record. The correlation between wildfires and temperatures is so strong that the center has concluded there's no room for reasonable doubt that the climate is warming and becoming more variable because of human activity and that the climate plays a role in the increase in fires. Wildfires now are burning more than twice the area they burned annually in the 1980s and 1990s in both forested and non-forested areas, despite a dramatic increase in the resources devoted to fight fires since the 1980s. Globally, the situation is a bit more complicated by different data in the tropics. Outside of the tropics, the fire season has lengthened across about 25% of the Earth’s surface and there has been a doubling of global burnable area affected by long fire seasons. In the tropics, however, climate change has resulted in wetter conditions. At the same time in Africa and southeast Asia, there have been reductions in the frequency of human-set fires to clear land for agriculture. Carbon dioxide fertilization and nitrogen fertilizer pollution have played a role in the rise in wildfires in some regions by increasing the growth of flammable plants. What is the overall environmental effect of fires? When an ecosystem suffers from too much fire, natural cycles are disrupted, native plant communities destroyed and the area becomes vulnerable to the spread of invasive non-native weeds that are highly flammable and in turn increase the frequency of fires. Some plants such as eucalyptus have flammable oils that encourage fire. Some plants produce fire-resistant seeds and extra shoots that sprout after a fire. Smoke, charred woods and heat can stimulate the germination of some types of seeds. Drought, logging, cattle ranching, and agricultural practices all can damage fire-resistant forests and promote the growth of flammable materials. Fires produce large amounts of carbon dioxide, damaging air quality. Because they increase the amount of carbon released into the atmosphere and inhibit the growth of vegetation, wildfires contribute to detrimental climate change. A large wildfire can lift smoke, soot and other particulates high into the atmosphere, as high as 20,000 feet, and cause the smoke to travel for more than 1,000 miles. Japan, for example, has experienced air pollution from fires in Siberia and China. Smoke from wild fires can cause serious cardiovascular and respiratory problems and increase ozone concentration to dangerous levels. The smoke also can increase the absorption of incoming solar radiation during the winter by up to 15 percent. The release of hazardous chemicals from wildfires significantly impacts health. Wildfire smoke is composed primarily of carbon dioxide and water vapor. Other common components in lower concentrations include carbon monoxide, formaldehyde, acrolein, polyaromatic hydrocarbons, and benzene, none of which are healthy to breathe. Carbon monoxide and fine particulates are the major health threats. The other chemicals usually are in concentrations too low to cause detectable health threats. Smoke from the Pole Creek fire, Mapleton, Utah. Smoke can cause headaches, weakness, dizziness, confusion, nausea, disorientation, visual impairment at high concentrations, asthma attacks, and eye symptoms. At lower concentrations, individuals with cardiovascular disease may have chest pain and cardiac arrhythmia. Worldwide, about 340,000 people die from the effects of wildfire smoke annually. Children below four years of age and the elderly over 65, smokers and pregnant women are considered the most vulnerable. Increases in human population growth have been associated with increased fire frequency as land is cleared of fire-inhibiting woodlands. 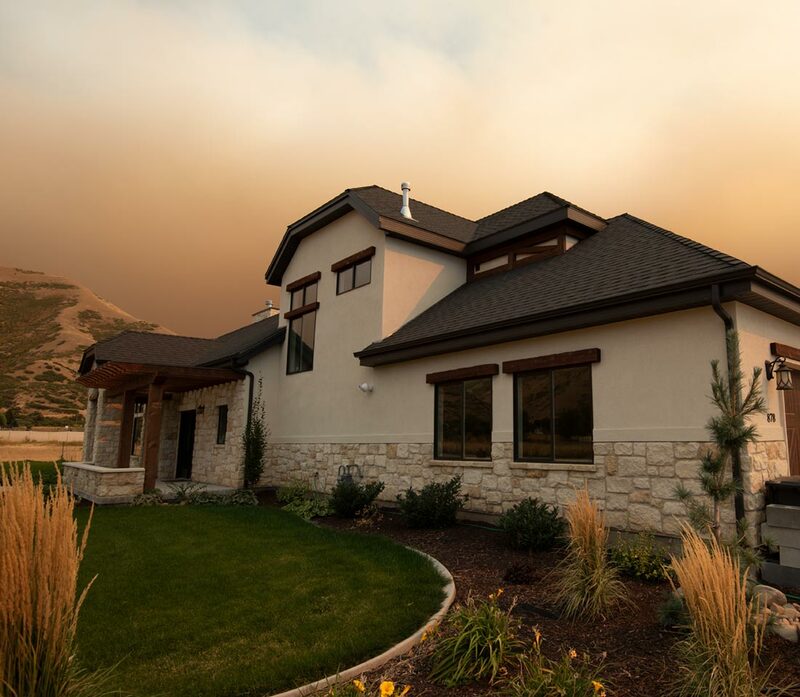 The most noticeable adverse effect of wildfires is the destruction of property, which has increased partly because the size of destructive fires has expanded and partly because more people are building homes in areas that are difficult to protect from fire. 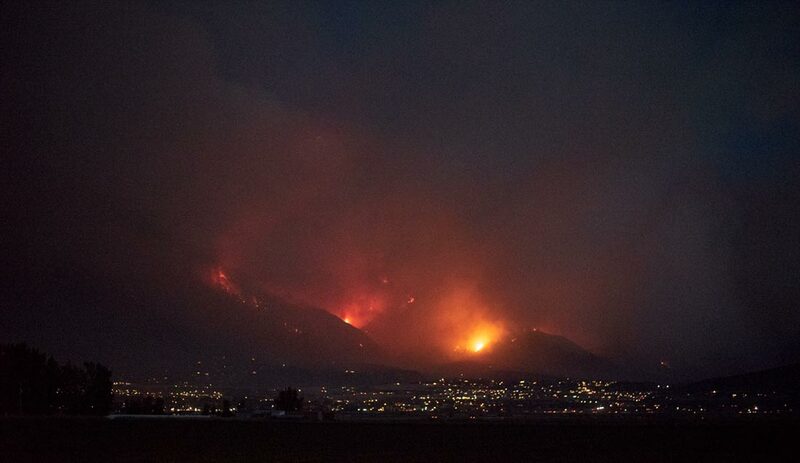 Fires burning in the mountains around Salem, Utah, where many new homes have been built in recent years. The damage caused by fires can increase erosion and create flash flood conditions. Wildfire debris also can contaminate soil and water and clog rivers and reservoirs, increasing floods and damaging water treatment systems. After a fire, falling fire-weakened trees are a risk as is indirect exposure to toxic chemicals through water and soil contamination. Psychiatric effects include post-traumatic stress disorder, anxiety and phobias as well as a deep sense of loss. 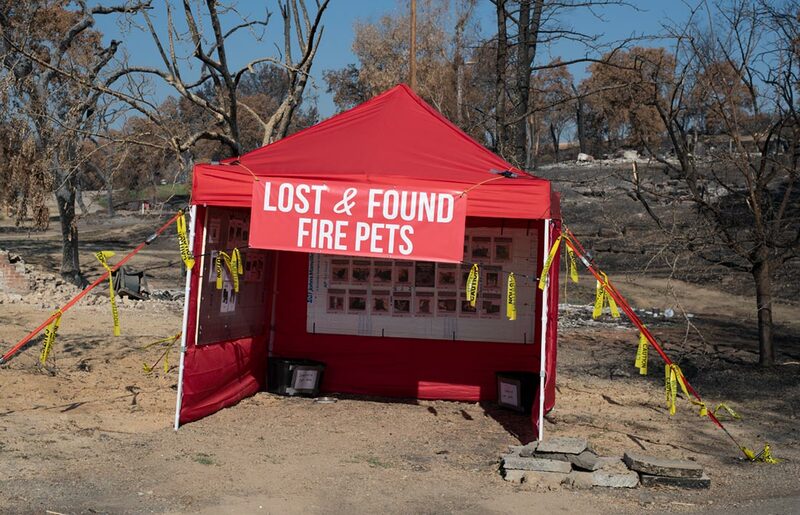 A display of lost pets in a burned out neighborhood in Keswick, California, after the Carr fire. In homes burned by wildfires, the remaining debris includes hazardous waste from batteries, paints, flammable liquids, asbestos siding, insulation, computers and monitors. Ash from fires includes harmful levels of heavy metals such as antimony, arsenic, cadmium, copper, lead and zinc. A warning sign about toxic materials in Keswick, California. These toxins can flow into water systems if it rains. Wind also can carry toxic dust. As a result, crews water ash and debris to keep it down as well as putting tarps over trucks carrying the materials away from home sites. Little remains of this house except the fireplace and toxic materials that need to be cleaned up by specialists. 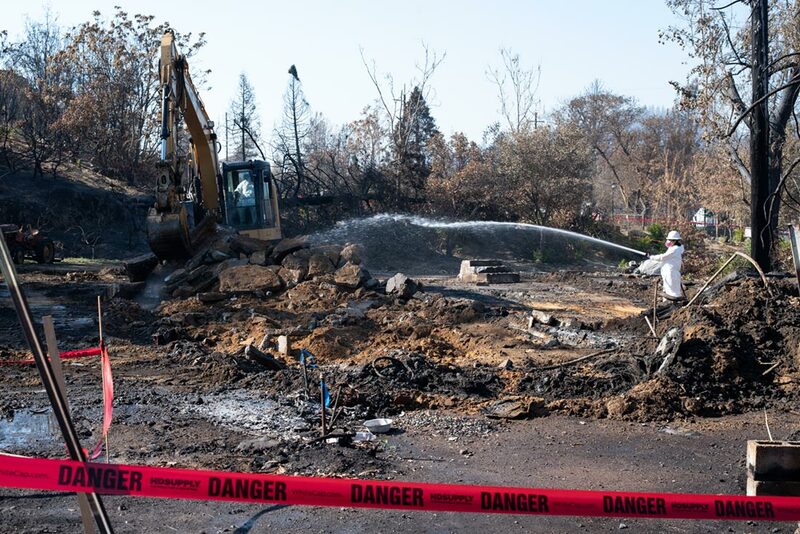 The standard procedure at a homesite after a fire is to remove debris, ash and contaminated soil, then grade or scrape the soil to remove additional contaminated soil and smooth the surface. After soil sampling and analysis, crews work to control erosion to minimize runoff and vegetation growth. Property owners are given certificates verifying their lots are clean before receiving building permits to rebuild their homes. 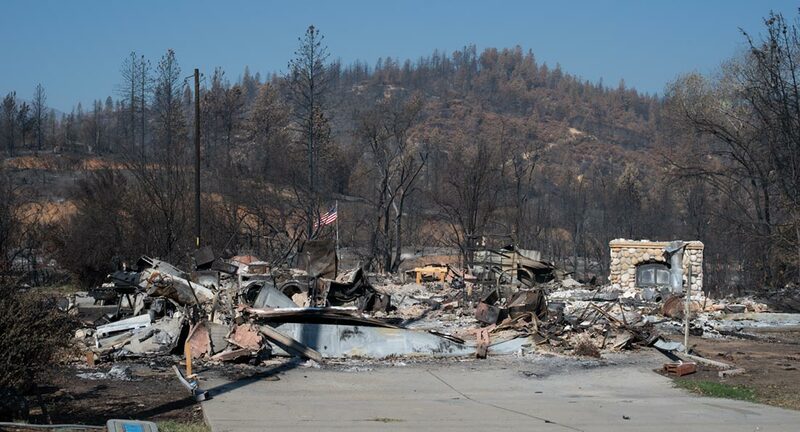 Because of the scale of wildfires in California, a coordinated cleanup effort with help from various governments involved is being carried out. Workers in protective suits and masks clean up a burned home site in Keswick, California. A worker sprays the site with water to keep down toxic ash and dust. Forrest Anderson and Donna Rouviere Anderson are working on a photo-illustrated book on the environment.